this is a program that will generate a random room layout and make sure it is 100% completable. Example of what you can expect. -Linear: will put the rooms in a linear fashion so that every colored door you see means there is an item or just a dead end. Blue door means the way to go or a save (saves are at their normal location). Some small modification have been made to some rooms to make them possible both ways. Also make sure some rooms will not permanently lock you up, such as adding a monster that drops a power bomb in red brinstar shaft along with other places. Some easter eggs twitch emotes scattered through the hack. Patch note is in the About button inside the program. Skills that may be necessary for this randomizer. -Be able to finish the game with 100% item collection. -F***ing ninja walljump to the top left door of the landing site. Definitely a fun thing to try out. There are many options to change your experience. This will take longer than you expect to complete. 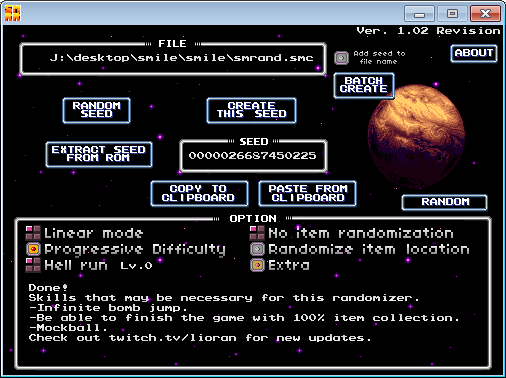 Great randomizer with some interesting customization options. Definitely give it a try.